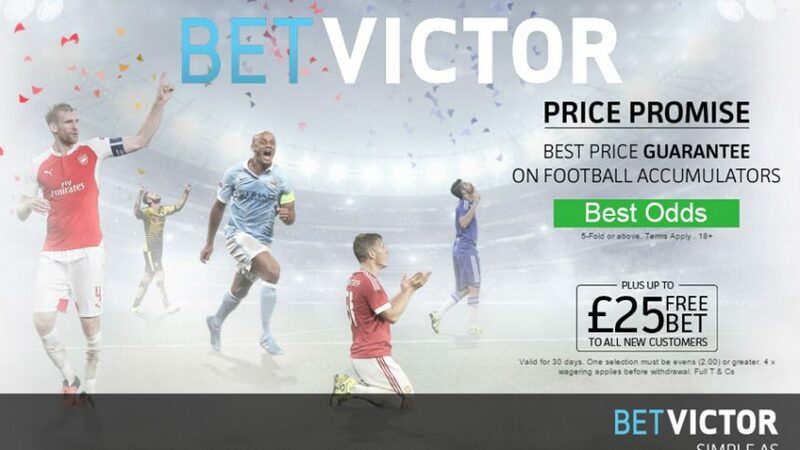 Get the best odds in the business with BetVictor Price Promise! Football betting is all about getting the most out of the odds, and even if it turns out you could have received a better deal somewhere else, you’ll still get to collect the difference. The way it works is simple; place an accumulator of five-folds or more, and you’ll automatically get the best odds with BetVictor Price Promise! If you win the accumulator, but you see that you could have won a bigger sum with some other online sportsbook, then BetVictor will pay you the difference of the odds. But don’t worry, you don’t have to do anything yourself. BetVictor’s system will take care of everything when you’re placing your bets, and it will automatically calculate the potential payouts with that of the competition. BetVictor offers plenty of betting options when it comes to football, so there’s always something to bet on. You can place wagers on any of the top tier leagues (Premier League, La Liga, Bundesliga and others), but if it’s one of those days without any big-time action, you can also play smaller division. Just check out what the event are for each day and place a bet with the accumulator to get the best odds. The online sportsbook offers a £25 Free Bet as a Welcome Bonus for new players, so you can have twice the fun! Make sure to use the BetVictor Price Promise next time you’ll be betting on football and you might walk away with a tidy sum! Check out the latest lucrative online casino promotions to boost your earnings! You can also follow the latest online sportsbook bonuses and promotions on Twitter and Facebook.